LEUVEN, Belgium, and CHICAGO, IL, USA - November 15, 2018 – icometrix, the world leader in software solutions to extract clinically meaningful data from brain scans, is proud to announce to have received an additional FDA 510(k) clearance for icobrain, which now also includes icobrain tbi for Computed Tomography (CT) images. Leveraging deep-learning algorithms, this product is the first CT product available to be applied clinically to help patients with traumatic brain injuries. Worldwide more than 50 million people suffer a TBI each year and it is estimated that approximately half the world’s population will be subject to one or more TBIs during their lifetime. Attempts to personalize treatment are hampered by the use of qualitative approaches to characterize the nature and severity of TBI. 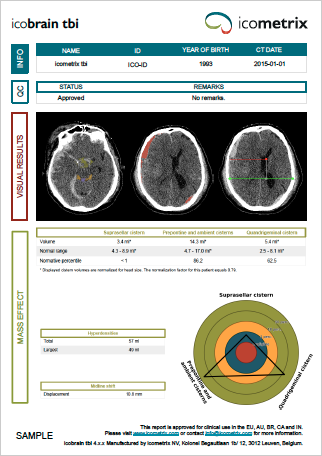 As the first TBI product available for CT, icobrain uses deep learning to quantify clinically important metrics, including hyperdense volumes, cisternal compression and midline shift to better characterise and management of TBI in acute clinical setting.